A three bedroom, semi detached property forming part of a character building and hosting off street parking and a private garden. 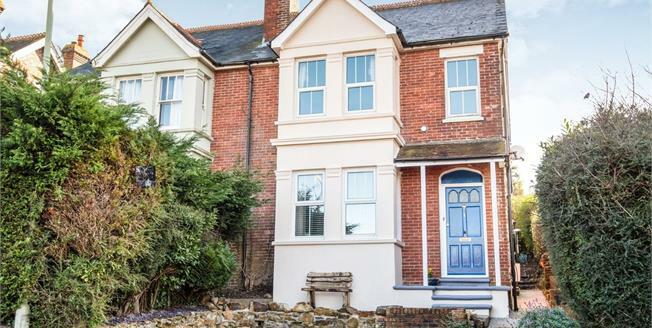 Arranged over three floors, this quirky house features a commanding bay fronted exterior with an attractive approach to the front door. Side access leads to a privately owned, secluded garden, back to back with the neighbouring garden, offering an area of lawn and space for seating. Internally, a spacious front room provides space for dining as well as relaxing, semi open plan with a contemporary, recently fitted kitchen. On the first floor there are two bedrooms and a modern family bathroom. Stairs rise again to the third bedroom located on the top floor. Heathfield offers a wide range of shopping facilities, eateries and good schools for all age groups. Mainline rail stations at both Buxted and Stonegate are approximately 6 miles distance and provide links to various London Stations. The Spa town of Royal Tunbridge Wells with its excellent shopping and leisure facilities is around 17 miles with the coastal towns of Eastbourne and the city of Brighton being reached within approximately 30 and 45 minutes respectively.